Taken in the back yard during September while I was testing before Calstar 2014. Fairly happy with how this photo turned out. 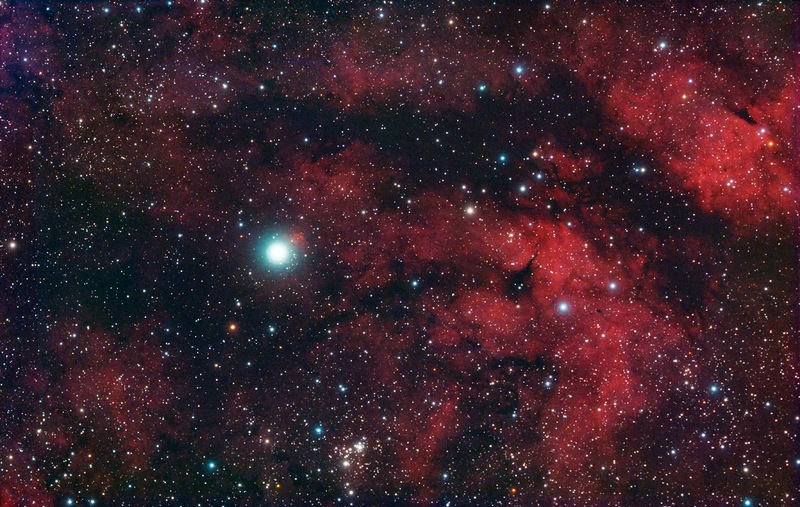 The nebulosity in Cygnus around the bright star Sadr, as seen in the back yard. Combination of Ha data and RGB data from the Pentax K10D camera. New subexposure duration and ISO setting used with the same Pentax camera. Now using 10 minute subs at 200 ISO. This is to reduce the effect of flexure on the results. Needed to create a new library of calibration files to support this change. Ha data gathered from September 10 & 11 with 52 subexposures of 10 minutes at 200 ISO. RGB data gathered from September 15 & 16 with 25 subexposures of 10 minutes at 200 ISO. Total integration time was 12 hours and 50 minutes. Calibrated in Maxim 5.24 with the new library with 36 flats for each filter, 64 bias, and 18-20 darks. Because the Ha filter made getting good flats to be a challenge, Maxim was set to use Median flats vs Bayer Planes. Here's what the Ha data looks like. This is the Red channel from the stack after registration with RGB, crop, and DBE.